One of our long-standing Java applications has several dependencies to native libraries, which are called via the Java Native Interface (JNI). We usually avoid native library dependencies, but this application must interface with some hardware devices for which the vendors only provide access through native libraries. 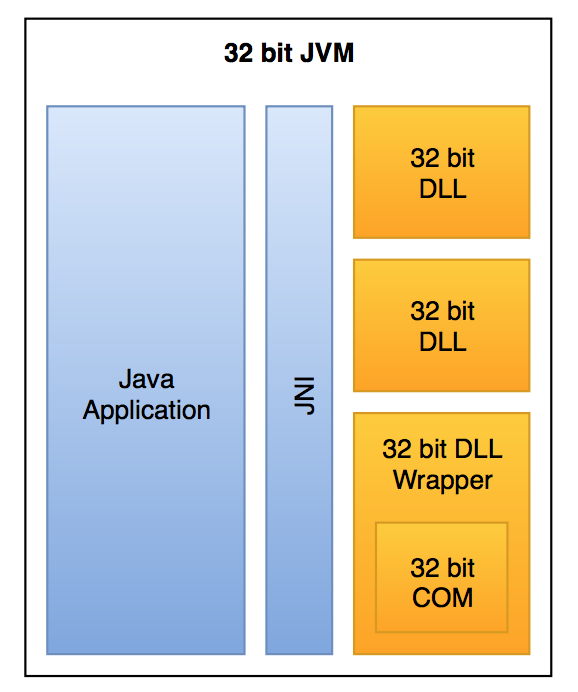 Until recently the application ran in a 32-bit Java VM and the native libraries were 32-bit DLLs as well. Then the time had come to update the application to the 64-bit world. We wanted the application to run in a 64-bit JVM, and 32-bit library code cannot run in a 64-bit process. We were able to replace the 32-bit libraries with 64-bit libraries, all except one. This particular dependency is not just a native library, but a Windows COM component. We had developed a wrapper DLL, which connected the COM component via JNI to the Java application. While we do have the source code of the wrapper DLL, we don’t have the source code of the COM component, and the vendor does not provide a 64-bit version of the component. So we decided to exile this COM component to a separate process, which we refer to as a container process. 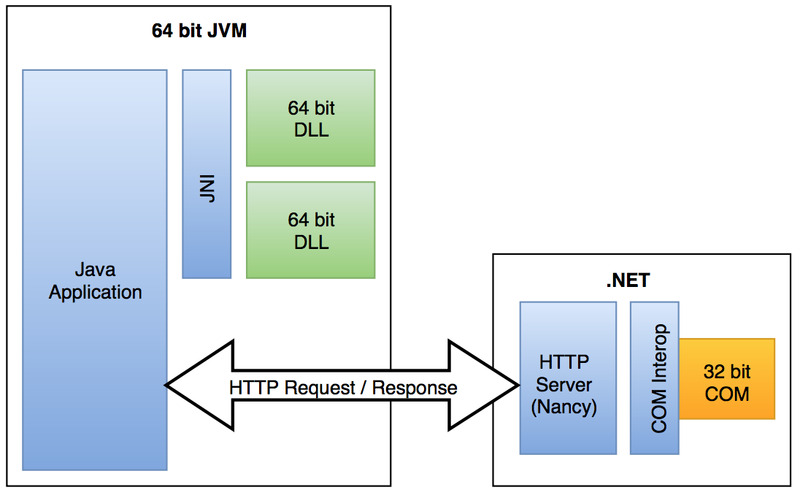 The main application runs in a 64-bit JVM and communicates with this process via a simple HTTP API. The API calls from the application do not require a very low latency. Initially we had planned to implement this container process as a C++ program. However, after a spike it turned out that there is a quicker way to both interface with a COM component and provide a simple self-hosted HTTP service on the Windows platform: The .NET framework provides excellent support for COM interoperability. Using a COM component in .NET is as simple as adding the component as a reference to the project, importing the namespace and instantiating the COM object like a regular .NET object. The event handling of the COM component, which requires quite some boilerplate code to set up in C++, gets automatically mapped to the C#/.NET event handling. The only reminder of the fact that you’re using a COM component is the amount of out and ref parameters. While it is a drawback that the container process now depends on the .NET runtime, it is outweighed by the benefit for us: The C#/.NET code for interfacing with the COM component is more maintainable than the previous JNI wrapper code was or a native implementation of the container process would have been.